Was like to have passed against us. Ely: But how, my lord, shall we resist it now? We lose the better half of our possession. Canterbury: The king is full of grace and fair regard. Ely: And a true lover of the holy church. And never noted in him any study. Henry V: Where is my gracious lord of Canterbury? Henry V: Sure, we thank you. Or should, or should not bar us in our claim. Was reunited to the crown of France. Henry V: May I with right and conscience make this claim? And lie pavilioned in the fields of France. Henry V: Call in the messengers sent from the Dauphin. France being ours, we’ll bend it our awe. Henry V: What treasure, uncle? Exeter: Tennis balls, my liege. Exeter: This was a merry message. Henry V: We hope to make the sender blush at it. Save those to God that run before our business. Act III, Scene 1. Before the walls of Harfleur. To his full height! On, on, you noble English! 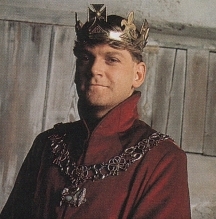 Henry V: How yet resolves the governor of the town? Do break the clouds....What say you? Will you yield, and this avoid? Or, guilty in defence, be thus destroyed? And fortify it strongly ‘gainst the French. Use mercy to them all.